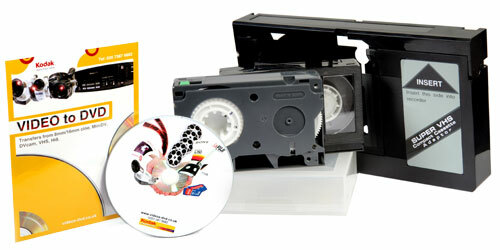 We transfer, copy and convert normal VHS, VHS-C and S-VHS video tapes to DVD and Editable File Formats. VHS-C video tapes were one of the more popular camcorder formats in the 80's and 90's. They were normally played back using the camera or in a special VHS-C adapter (shown below). Most VHS-C cameras have died and gone to heaven, and the adapters are hard to find, and less and less manufacturers produce video players. In addition, problems with mould, mildew, and the magnetic oxide coating shedding from its backing material, means that your home movies are at severe risk of being lost forever. Don't delay, send us your VHS-C camcorder tapes and we will transfer them to DVD or convert them into AVI movie files for home editing. VHS-C video transfers to DVD normally take about a week. However, if you need your DVD copies urgently, we can do them within 24 hours with a 50% rush charge. What we cannot do is improve poor quality video recordings. If you have VHS-C videos in NTSC format, they will need to converted to PAL format to play on UK television equipment.